West Boca Driver Injured In Two-Car Accident On Palmetto Park Rd, Boca Raton | Schuler, Halvorson, Weisser, Zoeller & Overbeck P.A. 23-year-old man of Greenwich Court in West Boca Raton is critically injured following a two car crash on Palmetto Park Road near Toledo Road. The victim was westbound on Palmetto Park Road, west of Toledo Road, in the outside lane when he was hit by another vehicle. The other vehicle was traveling at a speed well above the posted 50 mph speed limit according to the Palm Beach County Sheriff’s Office. The roadway was wet from a recent rain shower and the tires on his 2014 Mercedes Benz had low tread depth. He lost control of the car and struck the victim’s car. The impact of the collision caused the victim’s car to mount the raised center median. The right front of the car impacted with a tree and rotated in a counter clockwise direction as it moved in the southwest direction. The left rear of the car then impacted with a second tree. The vehicle came to rest in the center median against the second impacted tree. First emergency responders arrived at the site of the crash soon after the accident happened and the victim was transported to Delray Medical Center with serious life-threatening injuries. His current condition cannot be ascertained. W Palmetto road is partially closed at the moment due to the severity of the crash, causing traffic delays. Vehicles on this route are pulling to the roadside to allow crews work. Some are pulling into nearby side streets. The delay of traffic on this route is due to the severity of the crash. It is best to use an alternative route such as W Mango Road. 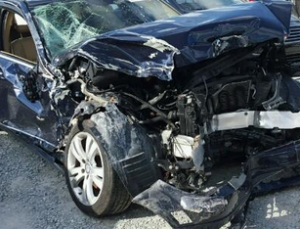 West Palm Beach personal injury attorney Jason Weisser of Schuler, Halvorson, Weisser, Zoeller and Overbeck responded to this accident. Please be careful and obey the speed limits and traffic lights whenever you are driving a motorcycle, car, SUV or truck. This is especially true when there are children in the area. We hope that all parties involved consult with an experienced trial lawyer. If you have been injured in an accident, call my office for a free consultation to find out what are your rights”.